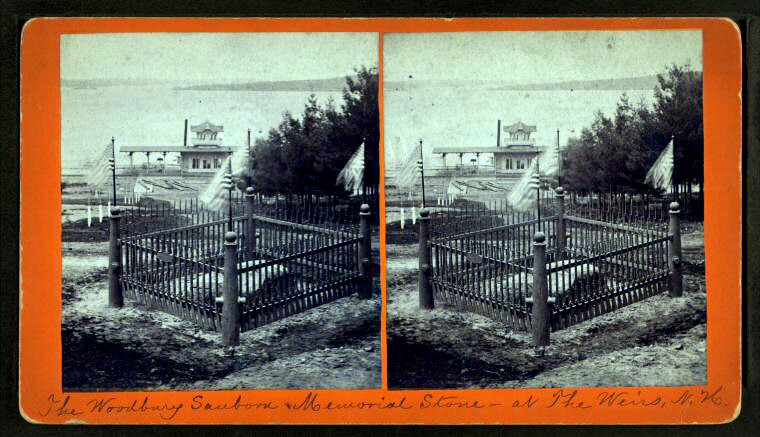 Two stereoviews of the Sanborn Memorial Stone, taken in 1882 upon “completion of the Iron Fence”. 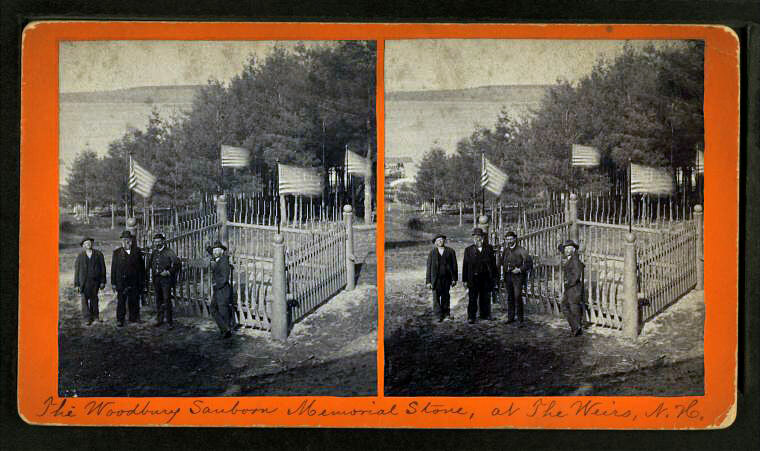 The bottom stereoview includes an actual photo of Woodbury Sanborn himself, second from left. 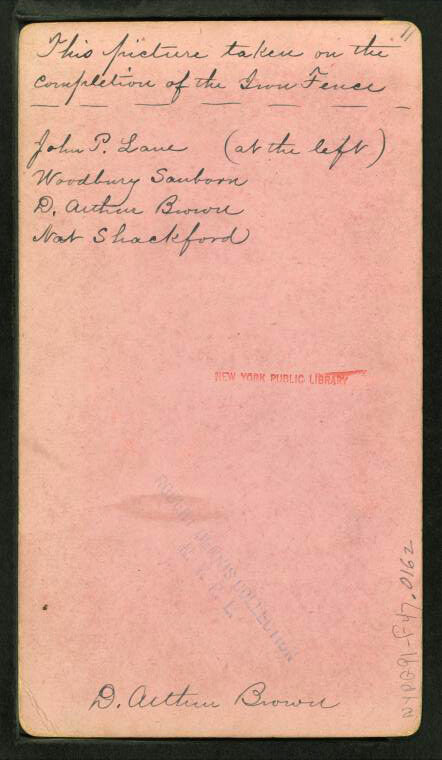 According to Warren Huse, author of The Weirs, Sanborn was a “sutler”, or civilian purveyor, of food, liquor and other comfort items, to the 12th Regiment. These photos were taken before the Memorial’s plaque had been erected. 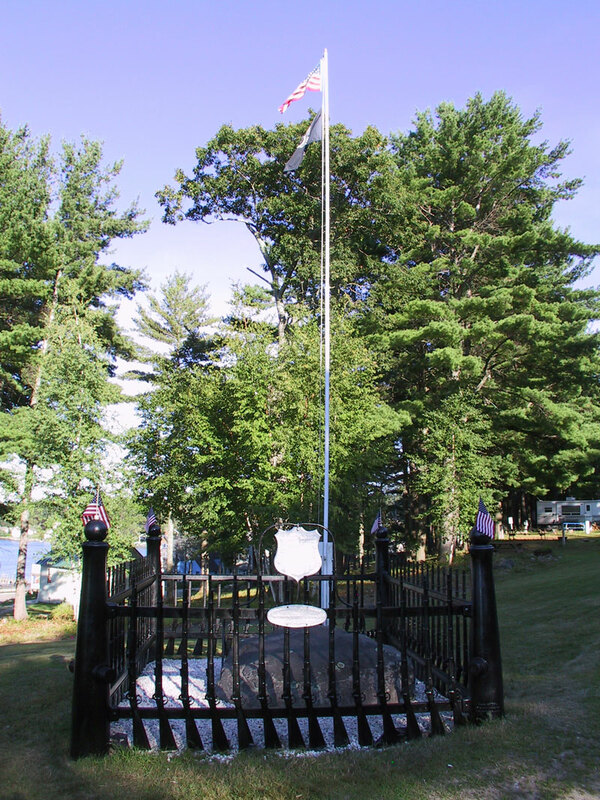 For more views of the Sanborn Memorial and photos of its plaque, including modern-day photos taken by the webmaster, please click here. Also seen in the group photo are: D. Arthur Brown of Penacook, third from left, who manufactured the Iron Fence; John P. Lane, left, who was a Lieutenant in Company G of the 12th Regiment; and Nat Shackford, right, who was a Captain in Company E of the 12th. 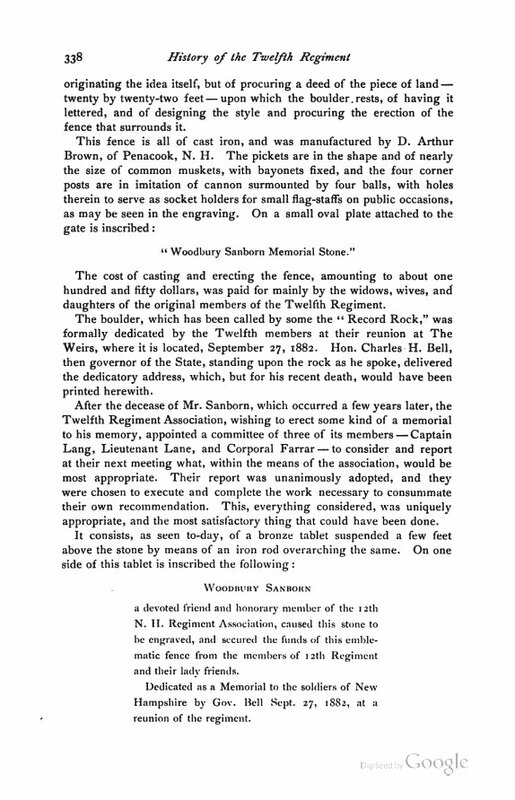 Bartlett tells us that Lane was the Treasurer of the 12th Regimental Association, and “one of its most active and honored members”. Of Sanborn himself, Bartlett says, “Although not an enlisted man, he was, unlike sutlers generally, so pleasantly identified from first to last with the regiment and personally with its membership, he certainly deserves a place among the boys he so long served. By his interest in their welfare he endeared himself to them all.” He was born in Gilford, December 20, 1822, and died at Chelsea, Mass., June 8, 1888. 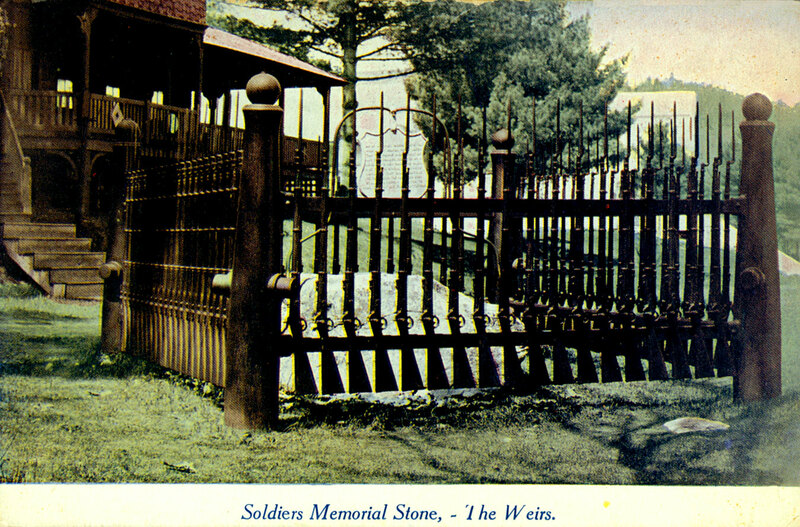 A circa 1906 postcard, published in “The Weirs”, shows the plaque, which was added to the Memorial circa 1890 to honor Sanborn. In the background we see a portion of the Manchester Veterans building. 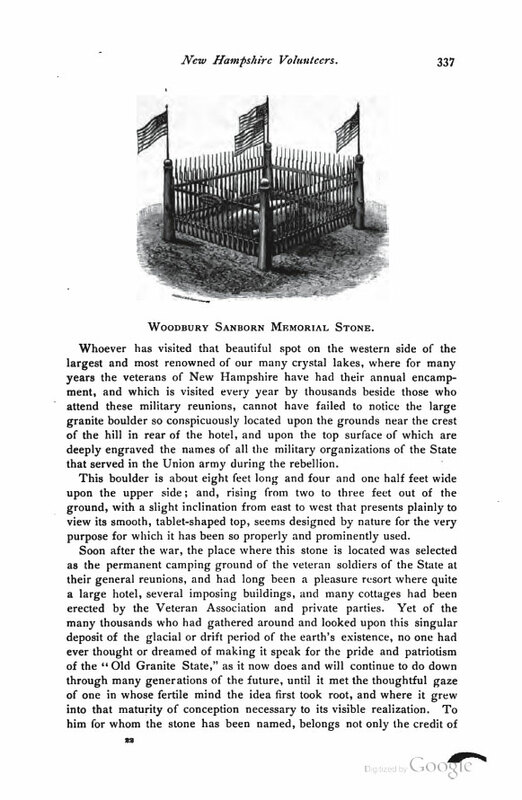 Below are 3 pages about the Sanborn Memorial Stone that appear in “History of the 12th Regiment New Hampshire Volunteers in the War of the Rebellion, by Asa W. Barlett, published in Concord, NH in 1897 by Ira C. Evans. 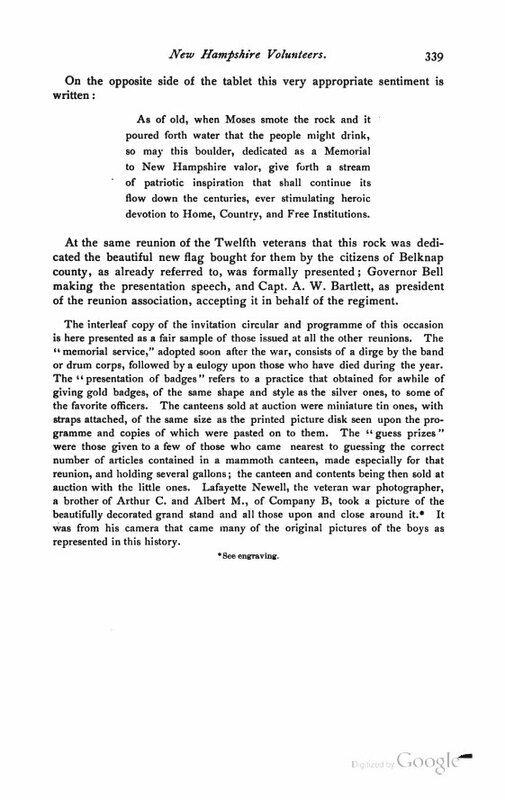 The full text of the book, which has been digitized by Google, can be found here. The Sanborn Memorial Stone in 2012, after a restoration. The rifles which form the pickets of the fence surrounding the stone are Spencer Repeating rifles, used extensively by the Union cavalry during the civil war. The rifles were often equipped with bayonets, as seen in the drawing below.